"This is a great updated twist on the traditional 'Nuts and Bolts' cereal snack mix." Combine cone-shaped corn snacks, cheese crackers, pretzels, corn cereal squares, mini shredded wheat squares, and pecan halves in a large bowl. Whisk butter, maple syrup, Worcestershire sauce, Cajun seasoning, and cayenne pepper in a separate bowl. Pour butter mixture over snack mixture and toss lightly to coat. Spread mixture into a 10x15-inch jelly roll pan. Bake in the preheated oven until snacks are lightly toasted and liquid has been absorbed, about 1 hour; stir every 15 minutes. This irresistible snack stars crispy cereal, nuts, and a simple caramel coating. 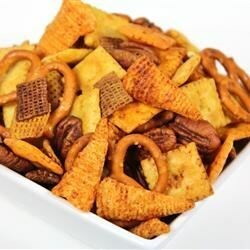 This is the best snack mix I have ever made! I did not change a thing. i like the mix of snacks in it, the bugles are a great idea! What i didn't like was that its pretty bland. i would make it again but add way more seasoning and probably some garlic salt. I like the mix also but like axelpaxels I thought it was pretty bland and would double the seasonings the especially of Cayanne,worcestershire and cajun. Also added some garlic salt. Made this last year for Christmas. We didn't care for the cayenne, so I substituted garlic salt for it. I also used Old Bay for the Cajun seasoning part. That made it a huge hit in our house. I doubled the spices and added an extra cup of cheese crackers. This has a kick to it but is always a big hit. Definitely need to make more of this than a sweet mix (Autumn snack mix). These have a nice flavor and kick to them!